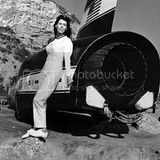 The Women’s Land Speed Record of 308.56 mph was set by Lee Breedlove driving Spirit of America Sonic 1 shortly after her husband set his new 555 mph record. Prior to this, it is claimed, Lee Breedlove had never driven over 75 mph. This achievement made her the fastest woman alive at the time, and madeher and husband Craig the fastest couple, which they remain today. According to author Rachel Kushner, Craig had talked Lee into taking the car out for a record attempt in order to monopolize the salt flats for the day and block one of his competitors from making a record attempt. Craig Breedlove was put on the payroll at American Motors Corporation (AMC) in 1968 to prepare the automaker's pony and high-performance cars, the Javelin and the AMX, for speed and endurance records. In January 1968, one month before the official introduction of the AMX model, Breedlove, his wife Lee, and Ron Dykes drove two cars were prepared for the speed runs. One was a 290, the other a 390. Some remarkable accomplishments: Class C average speed for 24 hours 140.790.mph; class B in 1000 kilometers standing/start the AMX averaged 156.548mph, and 75 mile flying standing start it averaged a whopping 174.295mph. ***ALL** records in the books were broken by Craig, Lee & the AMX from 25 kilometers up to 5000 kilometers and from 1 hour up to 24 hours; along with standing to flying starts. Absolutely amazing. And in 1968. Here is a black & white AMC Press Photo showing the #2 AMX; along with Craig & Lee in San Angelo, Texas, where these records were shattered. DETROIT FREE PRESS, Michigan, November 5, 1965.